Note: Attempt any five questions. All question carry equal marks. Missing data, if any can be assumed. 1. 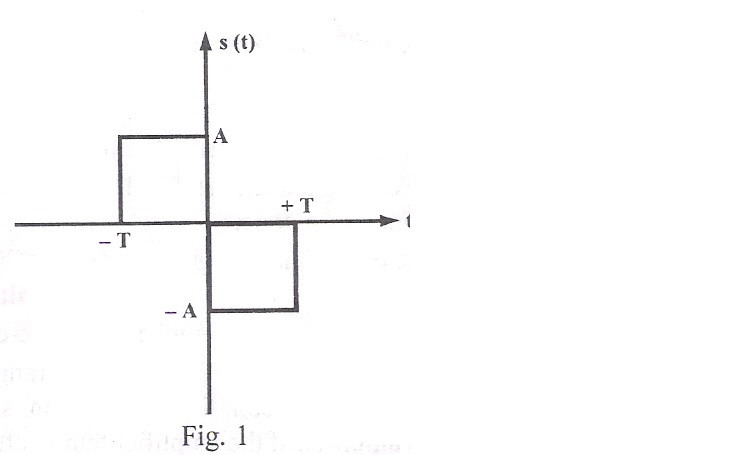 (a) Find Fourier transform of the given signal s(t) = 2t + t2 . (b) Find magnitude and phase spectrum of the given fig. © Find spectrum of ω (t) = sin 2 π f1t. sin 2 π f2t. 3. (a) What do you mean by narrowband and wideband FM? Kf =103 × 15 Hz per volt. 4. (a) What are the limitation of delta modulation system and how they can be overcome ? as compared to BPSK justify it. Symbols to be received incorrectly. (b) State source coding and channel coding theorems. Define efficiency and redundancy of a code. 6. (a) Calculate the overall noise figure of four amplifiers stage cascaded. (b) Why and where we use pre emphasis and de-emphasis circuits? Amplifier if the amplifier temperature is 200c. High level modulation and explain. (b) Explain function of superhetrodyne receiver. (c) Draw pharos diagram of AM and FM signal and compare them.